The NCAA rules around when and how college coaches can contact recruits are very poorly understood by the majority of new recruits and families. The biggest source of confusion is the fact NCAA rules say coaches can’t contact a recruit until Sep 1st of their Junior Year but athletes are routinely committing to and talking to schools well before that. In this article I am going to explain how you can contact coaches before September 1st and why it isn’t an NCAA rules violation. The key to the above statement, is to “prevent intrusions into the lives of student-athletes.” The NCAA recruiting rules are written to prohibit when a college coach can contact an athlete but not when they communicate with them. The NCAA considers a college coach calling you a potential “intrusion into your life” but if you initiate the contact, it is not an intrusion. Even though you might not have known about this loophole for contacting coaches, thousands of athletes do and coaches are inundated by emails and phone calls. Below I share a process for how you can break through the noise and get their attention. Send a coach your resume/online recruiting profile and highlight/skills video – It is best to introduce yourself to a coach through an email or online profile where they can make their initial evaluation. The critical information you need to include is video, contact info for your coach(s) and a schedule of where you will be competing. Get your coach involved and ask them to follow up with coaches for you – Because a college coach can’t respond to your email and they won’t just be waiting around for your phone call, you need to use your club or high school coach or organize a time for you to call. If you get on the phone, set a time to connect again – If you are fortunate enough to talk to a coach, you need to be sure and leave each conversation with a clear date and time to connect again. Many times coaches and recruits will have a set day and time for the recruit to call each week. What Happens if a Coach Doesn’t Respond? There are a few reasons why a coach doesn’t respond to your email/phone calls. The most common reason is they don’t think you have the potential to play for their program (yet). The other reasons might be your coach isn’t relaying the information to you or they don’t have the proper contact info to contact your coach. 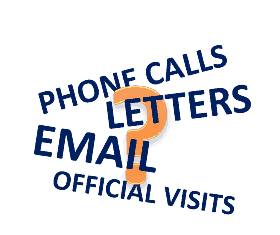 Because college coaches can’t contact you directly, it is impossible to know why they aren’t returning your messages. All you can do is continue to reach out to more and a wider range of schools. Alverno College Sports Recruiting. Bowie State University Sports Recruiting. Bowling Green State University Sports Scholarships. Boyce College Sports Recruiting. Are you having trouble finding opportunities to play at the college level? Ask your questions below and we can answer them.